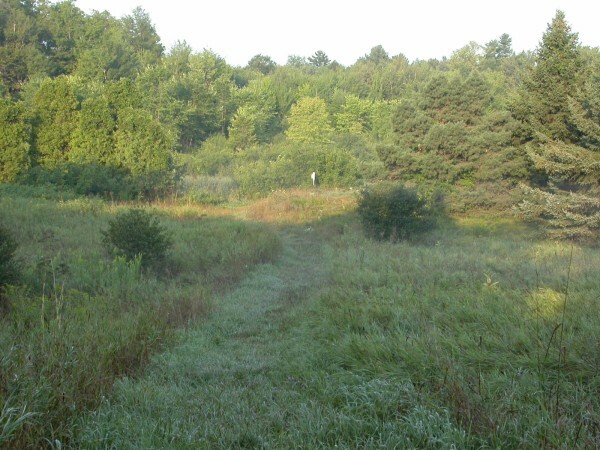 The census trail covers a distance of approximately 1.2 km, and is designed to sample all the habitats present at MBO. It is walked daily during the spring and fall Migration Monitoring Programs, and periodically in summer and winter. 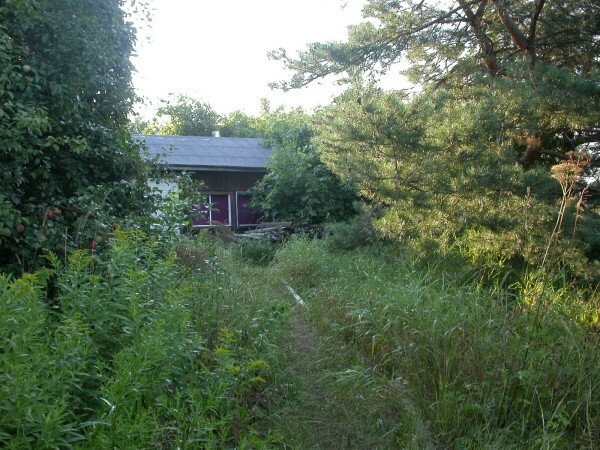 The census route begins at the banding cabin, and proceeds in a counter-clockwise direction. The original path of the census route is shown in green on the map below; to make it easier to walk it in one hour for standardization purposes, it has since been adjusted to cut in to the property from point 16 to 19, continue up to 18, and terminate at that point. The remainder of the original route is quite well monitored through regular net rounds and/or other observations within short walking distance of the banding station. The photos below illustrate the view at 24 points along the original census route (locations indicated on the map with orange dots). All photos taken by Marcel Gahbauer in mid-August 2005, unless otherwise noted. 1) The census begins at the "parking circle" just south of the banding station. With a view of the windmill to the west, and the neighbouring farm fields to the east, watching and listening from this spot for a few minutes usually gets the daily census list off to a good start. 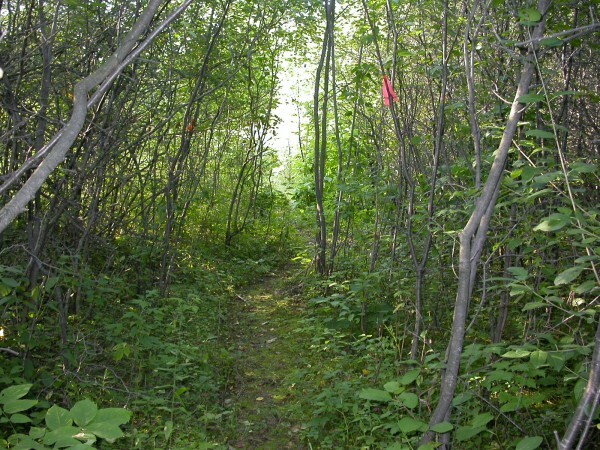 2) The first section of the census route follows the old lane north along the edge of the MBO property. 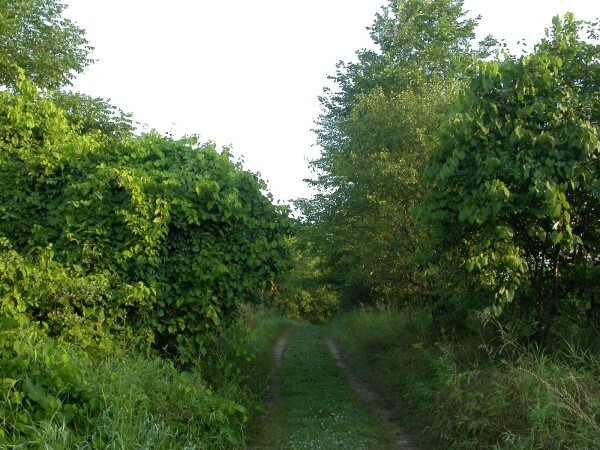 It has become known as "Warbler Alley" thanks to the wide variety of warblers that frequent the area, especially in August and early September. 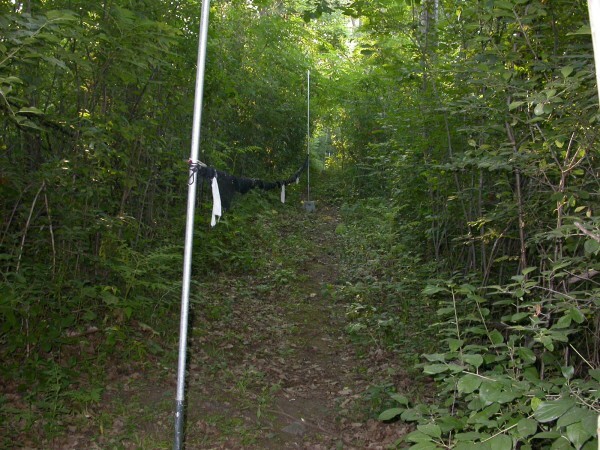 The photo below shows the entrance to Warbler Alley behind the banding station, where nets K1 and K2 have since been installed. 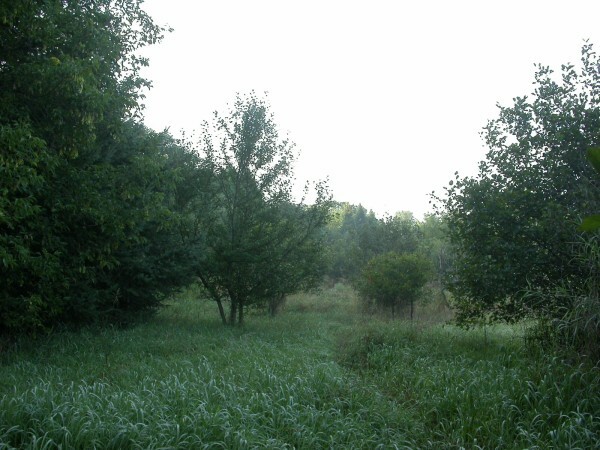 3) All along Warbler Alley there is dense vegetation, mostly a mixture of buckthorns and hawthorns interspersed with taller trees such as walnuts, ashes, and poplars. 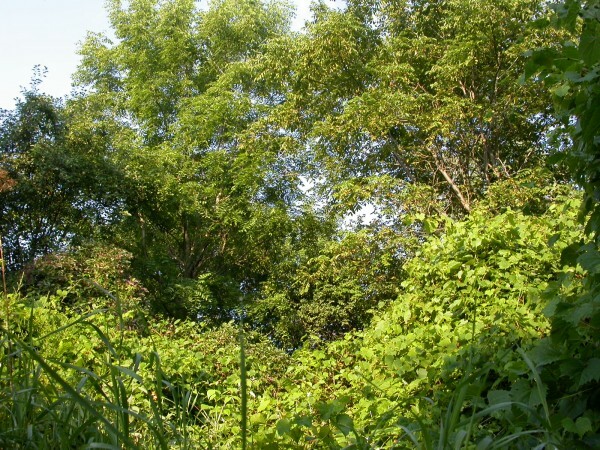 The walnuts and grapevine-covered shrubs near the midpoint of this section can be particularly active in fall. 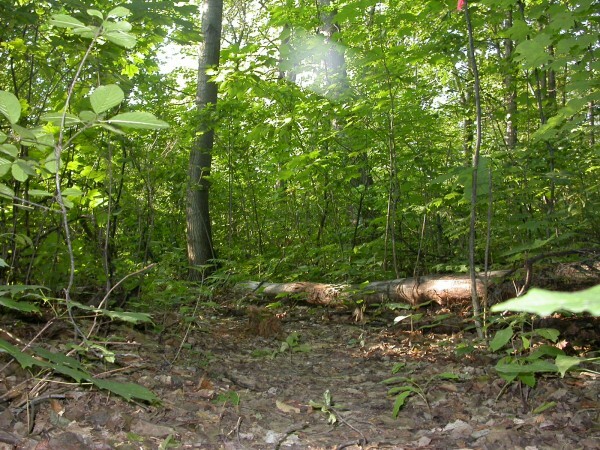 4) Just before the census trail reaches the northeast corner of the MBO property, it turns left and heads into the "Back Woods", an area of mature deciduous forest dominated by maples. 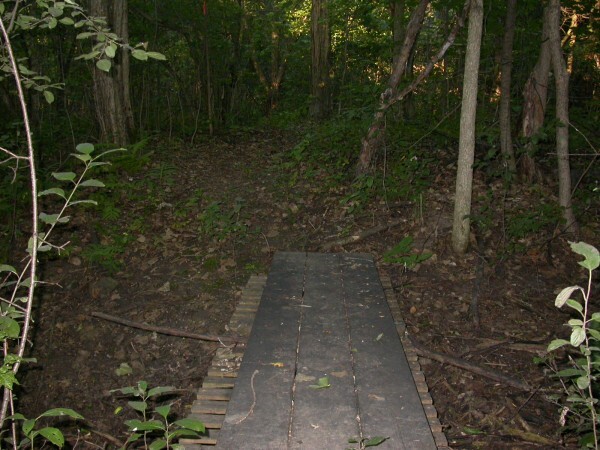 The unique double-layered footbridge shown in the photo is essential in spring when drainage from the Back Ponds almost entirely fills the ditch. 5) The "Back Ponds" are a collection of artificial ponds created by Ducks Unlimited in the 1970s. In spring, water levels are often high enough to result in a large single pond, while by late summer the ponds may all be entirely dried up. Water levels of course have a significant impact on the presence/absence of waterfowl, shorebirds, and a number of other species. 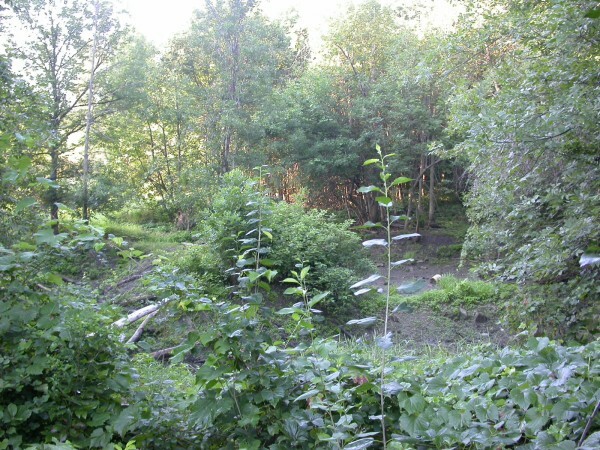 The view shown below is of the north end of the ponds after a dry summer. 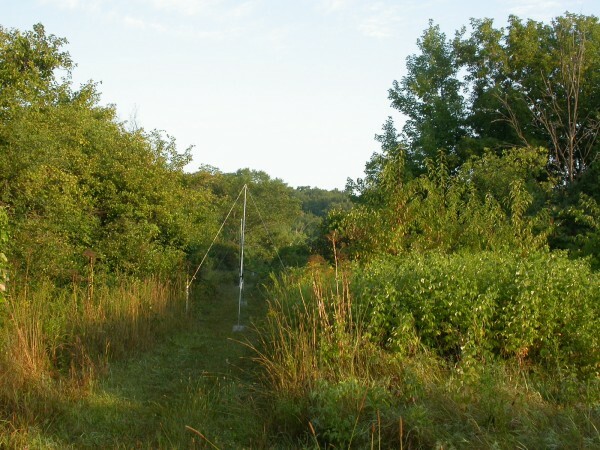 6) A series of 8 nets line the ridge along the eastern border of the Back Ponds. Four of these are used regularly for migration monitoring, while the remainder are added for owl banding to create an uninterrupted 104-metre long set of nets. 7) After 15-20 minutes, the census trail passes by the banding station. The censuser(s) may check quickly with the Bander-in-charge at this point to exchange information, but otherwise generally continue on quickly. 8) The census trail curves around the windmill, and west down the slope toward Stoneycroft Pond, through an open area with a number of mature apple trees. 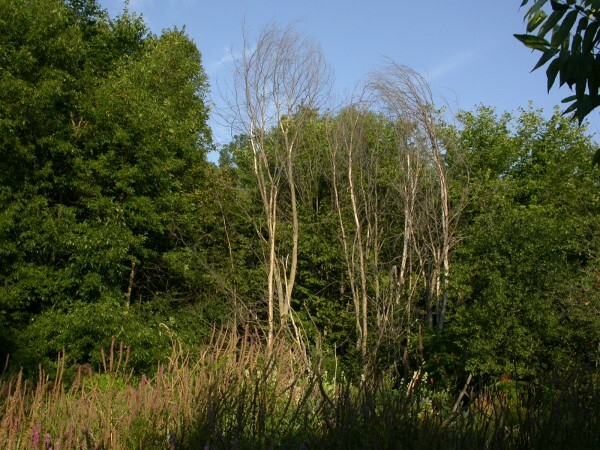 9) From the bottom of the slope, the census trail provides the first of 4 views of the famous "Dead Tree" - a tall tree along the east shore of Stoneycroft Pond that almost always has a variety of birds perched in its bare branches. It is worth looking at the tree closely every time it comes into view, as the birds present change frequently. 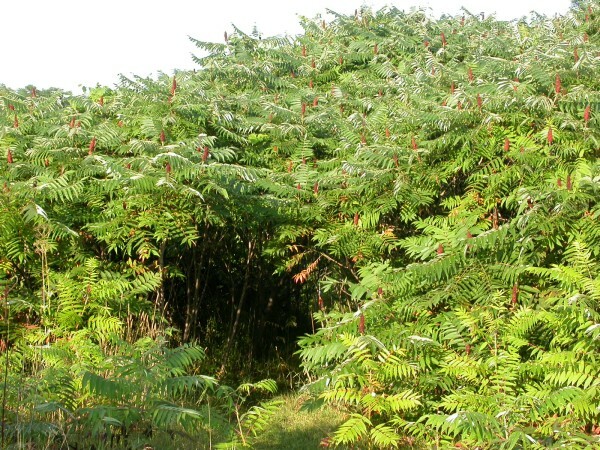 10) The lush sumac grove below conceals nets C1 and C2, and provides access to the west side of Stoneycroft Pond. 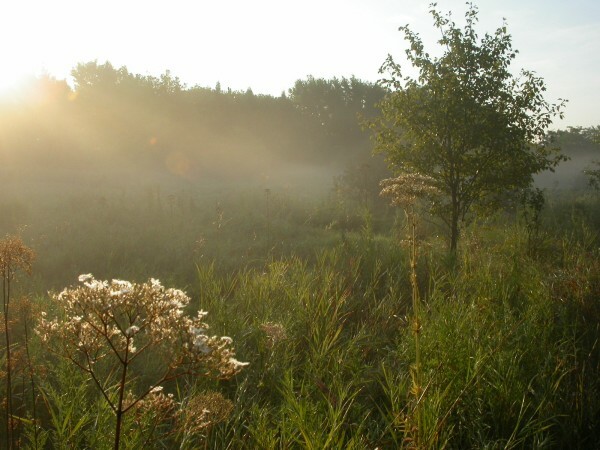 11) At the far end of the spruce grove is a small wetland patch dominated by purple loosestrife and a small stand of dead trees that are particularly favoured by hummingbirds in fall. 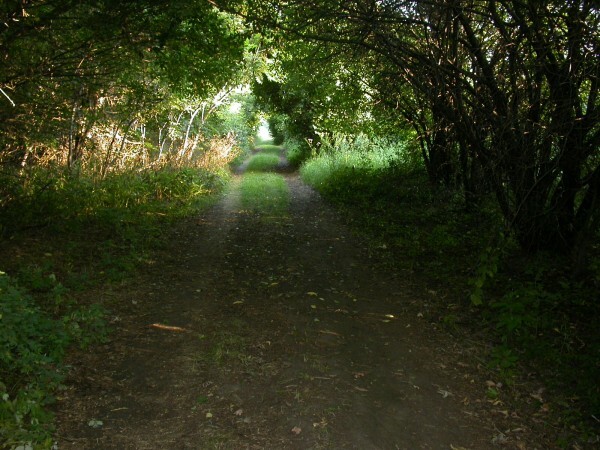 12) The next section of the trail goes through another section of mature forest, a mix of oak, maple, and beech. 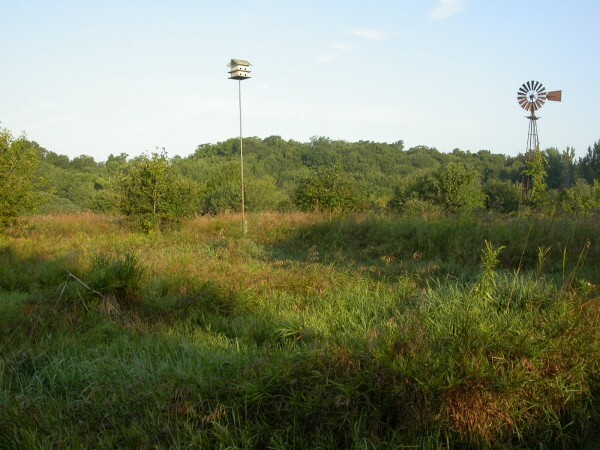 13) An open area around the G nets features a lot of edge habitat that attracts a variety of warblers and other passerines in migration. 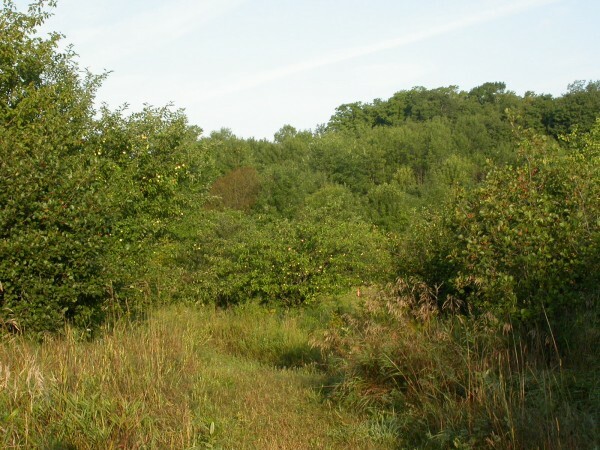 14) After passing the G nets, the path curves back down to a lookout over the midpoint of the west side of Stoneycroft Pond, then goes through the buckthorn thicket shown in the photo below. 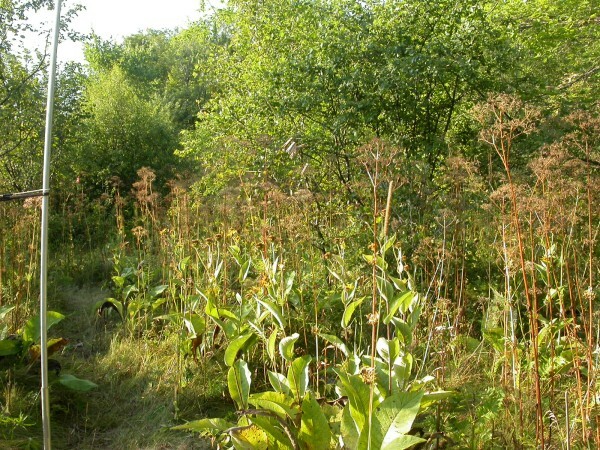 15) Along the southwest side of Stoneycroft Pond is an extensive open and fairly wet area. 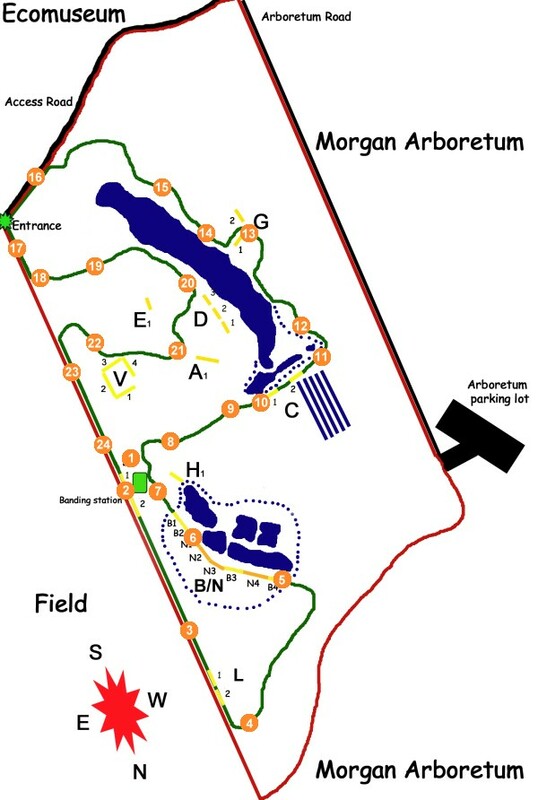 16) The census trail pops out to the road briefly before going back in through the main gate. 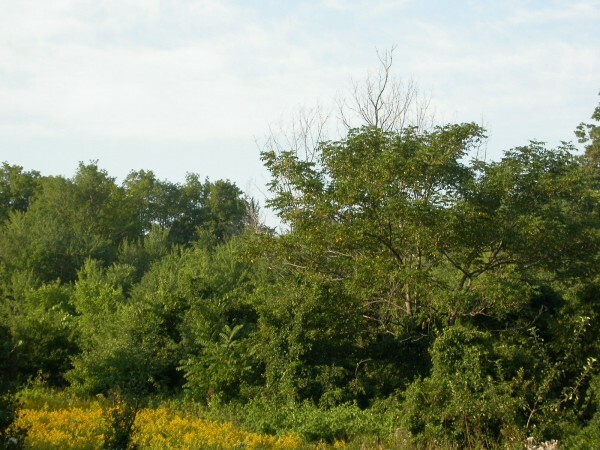 The Ecomuseum is to the right, and there are often birds in the tall cedar hedge along the road. 17) Walking up the small slope from the gate, the focus is usually on the dense shrubbery on the left, that can harbour large numbers of warblers, sparrows, and other migrants. 18) The census trail turns to the left at this point, passing under butternuts and locusts on the way back down toward Stoneycroft Pond. 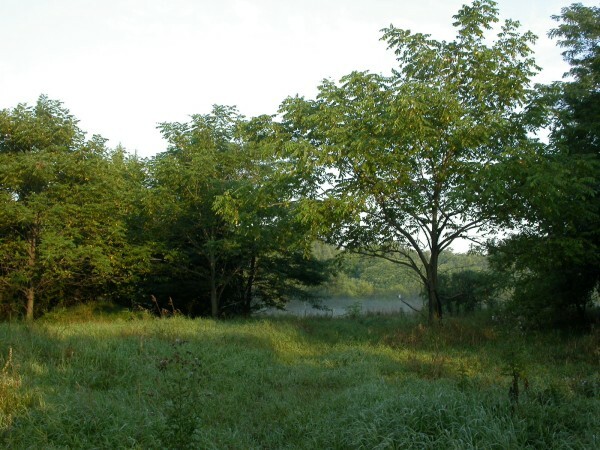 19) At the centre of MBO is a large tallgrass meadow with scattered hawthorns and other shrubs. 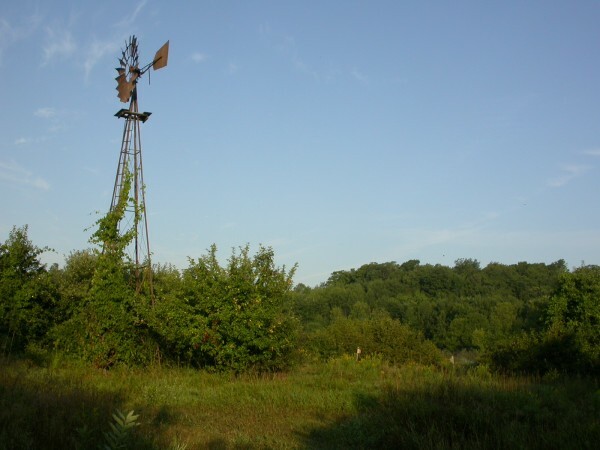 The census trail passes along its north edge at Apple Lane (points 8-10), and skirts its southern perimeter here. Near the bottom of this slope, the cedar grove on the left and mixed conifer grove on the right are worth scanning closely for warblers. 20) The census curves to head north along the east shore of Stoneycroft Pond, and then turns away from it just before reaching the D nets. 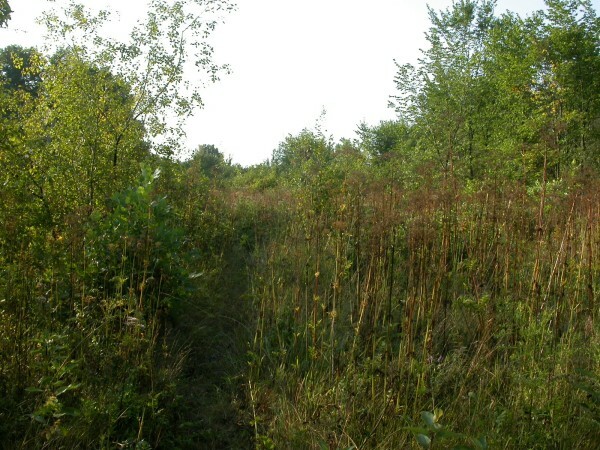 21) The census trail cuts across the middle of the meadow - an often wet experience for the censuser when the dew is heavy on the grasses and goldenrods. 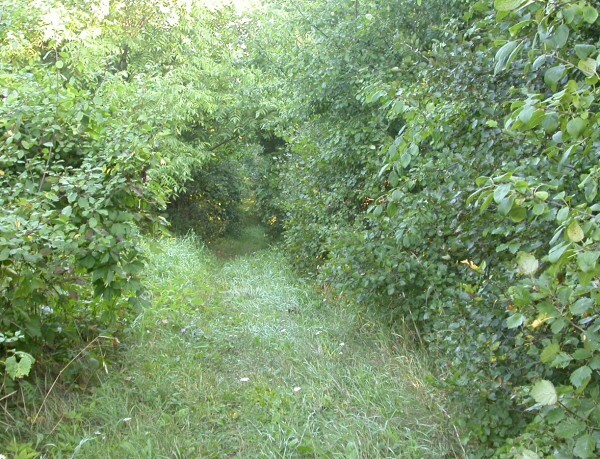 22) After crossing the field, the census trail skirts the edge of the narrow woodlot lining the access lane. The conifers along this part of the route are another important opportunity to search for boreal warblers. 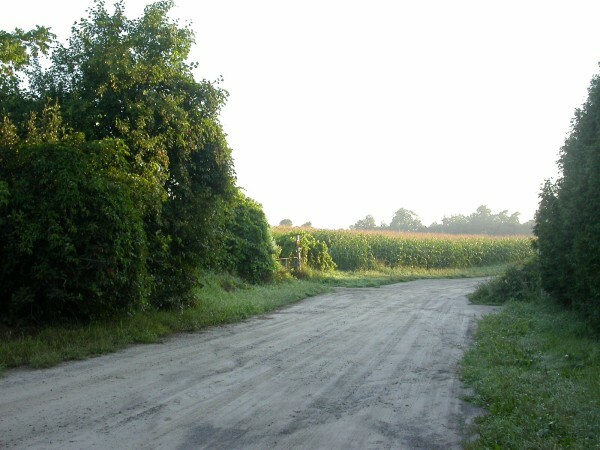 23) The home stretch of the census trail is along the access lane. 24) The census concludes as the access lane emerges back into the clearing and reaches the parking lot. A brief final scan of birds around the windmill is conducted, with care not to double-count any individuals seen at the start of census, or while passing by between points 7 and 8.